Homeschooling and Homemaking should go hand in hand, right? You are home with your kids *most* of the day, which obviously leads to plenty of time for homemaking. It should be easy to manage math lessons and laundry, getting supper on the table, and having a cheery home. If you are in a stellar homeschooling and homemaking routine, this might not be the post for you! Homeschooling and Homemaking are two things that are important to homeschoolers. Notice I said homemaking and not cleaning your house? Homemaking does cover cleaning your house, but it includes more than that. Homemaking is making your home a welcome environment for your family as well as your friends. Homeschooling can easily put a wrench in that environment. It took me a long time to accept that homeschooling would not always allow for a pristine home. I thought that because I was home with my kids all day that homeschool and homemaking would easily happen in harmony together. The reality of this – not so much harmony. Perhaps organized chaos if we are lucky. Do you remember back when we worked on the time inventory? Part of the reason you did this was to find margin in your days and weeks. That margin was going to be partly for self-care, partly for things that your family loves, and also you need to fit in homemaking. It is very easy to fall into the trap of one or the other. Suddenly you realize homeschooling and homemaking do not go together. In fact, they tend to war with each other requiring all of your time. How do you balance Homeschooling and Homemaking? The first part is acceptance. You have to realize that your home is not going to be the same as someone who is out of the home every day, or who does not homeschool. There is a big difference between living in our homes day in and day out, and only being home to sleep plus a few hours here and there. Homeschooling and homemaking can find harmony together, but you have to adjust your expectations. When you look at your schedule, you will often fit so much into it, that you don’t know where the homemaking could actually be placed. You either put everything you have into homeschooling, and let homemaking slide, or you go on a decluttering binge and take a week off of homeschool. However, there is a third option. Everyone always says to include your kids in chores. But, what they don’t say is the time involved to teach your kids all of these chores. When your schedule is full of obligations, you don’t have the margin to train your kids to do certain chores. It is 100% easier for me to do all the cleaning and chores. I am faster at it, and I know how to do it. That is a disservice to our kids though. They need to learn how to do these things as well. Eventually they will be adults, and if you have always done everything for them, they won’t be able to function well. When my husband tells our kids to “go clean your room,” he would often think that should be enough. What would happen though, was that our kids would go into their room, look at the mess, and become completely overwhelmed. They couldn’t see the end of it. And they didn’t have any steps to follow. What should you do in that situation? Partner with your kids. What does it mean to partner with your kids? First, you need to show them how to do the task at hand. This is going to be something that takes repetition. You will not be able to show them one time and have them complete their chores easily. It is going to continue to be a struggle. Kids don’t want to clean just as much as you don’t want to clean. It will take time. You will need to make it a priority to partner with your kids. Homeschooling and homemaking go hand in hand this way. Homeschooling is not just about academics, it is about the whole child. You want your child to be a productive member of society and a good steward of their own home. Learning to make the bed and do the laundry is part of that. Yes, it takes a lot of time in order to train your children. Both in character and in chores, but you will be thankful in the long run. I remember reading post after post by Renee Tougas about how she would always have her kids in the kitchen helping her from a very young age. At some point, she was able to relinquish most of the cooking of meals to her children. How amazing is that? To put that time in at the beginning, and then be able to turn over some of that responsibility. It all comes back to time though. You can be frustrated by the time that it takes to train your kids to do these things. Or, the alternative, is to embrace it. Embrace how homeschooling and homemaking go together. If you look at your schedule and see that you don’t have time to train your kids in these essential tasks, you might need to create more margin. It may not seem so important when your children are young, but it is one of the most important things you can do for your kids. 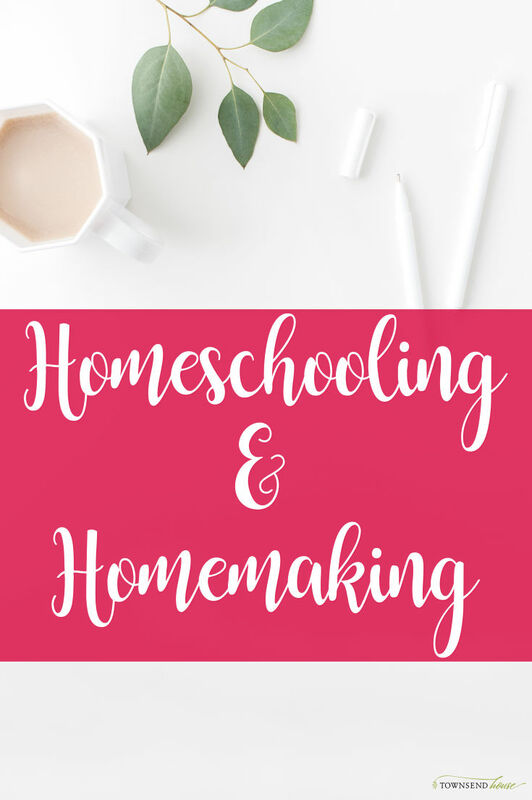 How do you combine homeschooling and homemaking? Because we are homeschoolers, we have the unique opportunity to set up our schedule exactly as we see fit. We make the choices, no one else. When I make out lists for my kids each day, I put their chore on their list. It is there, they know what it is, and then they can do it when they see fit and yes, sometimes I still have to remind them!. If it is something new, or something that takes a longer amount of time, it will be during our morning chore time. Between 8-9am our kids have free time and chore time. If I am training them on something new, I can incorporate it during this time. This is for our older two who are 10 and 8. My youngest who is still just 3 will come along side me and help me with whatever I am working on. I have her involved in it from the beginning, and she is a much more willing participant than the older two! My kids aren’t that young anymore! If your kids are older, and you haven’t spent a lot of time training them when it comes to homemaking, now is a perfect time to start. These are important life skills, and they can’t be overlooked just because your child is involved in an orchestra or has sports practice 4 nights each week. You need to make the choice to do these things now. Homeschooling and Homemaking do go together, even though you think they would be warring against each other. If you create margin in your days, and put specific tasks in time blocks, this will help you to succeed in this area. If you think that everything will be perfect, you are sadly mistaken. Don’t let that perfectionist mindset take hold of you. I had that for so long, and was essentially always disappointed. I couldn’t seem to get ahead. Every time we picked up the whole house it would get destroyed 30 minutes later. This is part of accepting that you are in the home more than you are out of the home as a homeschooler. Once you release some of those expectations, you will see that your homemaking is really quite good! You feed your kids, they have clean clothes, your beds are made (most of the time!). These are all amazing accomplishments – but may not seem amazing because of preconceived notions. Don’t forget that when you look at those amazing Instagram pictures, you don’t have the whole story. Just out of the shot there is a pile of papers, or laundry hidden behind a curtain. Or maybe that person isn’t a homeschooler. Perhaps they have someone come in to help them clean once a week. Whatever the case, don’t beat yourself up because your home looks different than what you see as ideal. Do you struggle with balancing homeschooling and homemaking? Is it one or the other for you? Can you combine these two important facets of your life with your kids?